Fill out, snap a photo, sign, and send… that’s the power of an e-forms in insurance. Time is money and no one likes to sit and fill out a bunch of paper forms that then need to be retyped to start a claim. That is why the insurance companies are moving towards electronic forms where you as the customer can fill them out at your convenience. 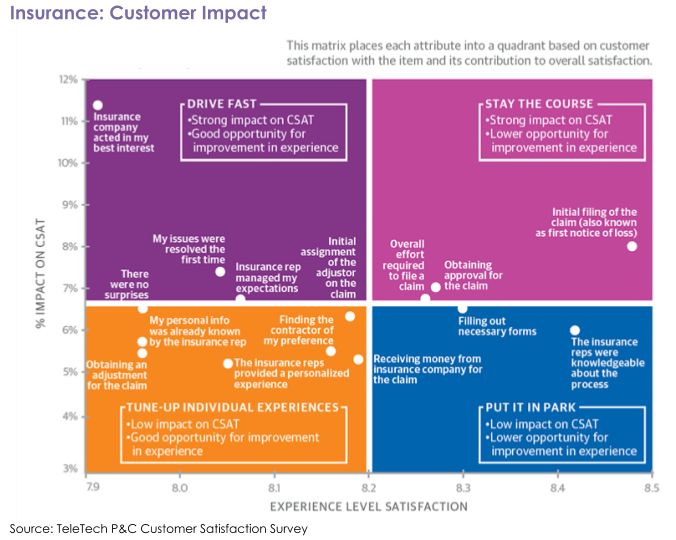 The latest research of TTEC shows that customer experience in the insurance sector is a coalition of many factors, which requires a combined strategic approach when making improvements. The below figure shows different drivers, which have a strong impact on the customer satisfaction, such as “insurance company acted in my best interest”, as well as overall experience when an insurance claim happens, such as “initial filing of the claim”, “filling out necessary forms”, “finding the contract of my preference”, “overall effort to file a claim”. Based on these factors we can see that there are many document-related working steps that have a direct impact on the customer experience. These working steps can be automated and speeded up using smart e-forms, omnichannel customer communications management solutions, smart workflow and collaboration tools. Therefore, in today’s blog post, we are going to discuss how some of the typical insurance working steps look before and after implementing digital solutions for information capturing, handling and processing. A few years back, in order to get an insurance quote, you had to visit a local agent’s office and speak to them directly regarding your needs. While in the office, you would fill out several paper forms with your personal details and the items you want to insure. After providing all the information, the agent then would retype all this information into their system to calculate the quote. After, he or she would print out a copy for your review. When the quote would be accepted, the final insurance policy would be printed to be signed. In some cases, after you sign the policy, the agent would scan the signed copy to create a digital image for their records and the paper copy would be stored in a file cabinet. Not to mention, a photocopy of this policy would be given to you. In the present time, to get an insurance quote, a customer fills out an electronic form online to submit all required details. Within a few minutes, he or she gets an instant quote. After the quote is accepted, the customer can electronically sign the policy and have the digital signed copy emailed. Before electronic forms were introduced, filing a claim used to be a hassle. After an incident, a person would get on the phone to call their local agent and report a claim. The agent would ask the person to stop by the office to fill out some paperwork where they provided all the details regarding the claim. The agent then would assign a claims adjuster to look into the damage. Once the claims adjuster prepared his or her report, it would be shared with the local agent for a review. Lastly, the customer would visit the office to sign off on the final decision and settle the claim. Remember, that the local agent may have many customers, so the claim’s process could take anywhere from a week to a month depending on the incident and the agents’ availability. Now, with electronic forms, to file a claim is fast and easy. After an incident, you call your agent and he or she emails you a few electronic forms to fill out and electronically sign. Once the forms are filled out, you email them back to your agent. Many larger insurance companies utilize mobile apps that have built-in electronic forms where there is no need to call an agent. Simply log into the app, select the right options for the incident, fill out the forms, take some pictures, e-sign, and submit. Since all these forms are submitted electronically, there is no need for the agent to retype anything and with the workflow capabilities, the right people are notified about the next steps. This process takes anywhere from a few hours to a few days. To add more coverage to your current insurance policy, we used to go back to the local office and fill out more forms. Technically, redoing the entire process of getting a quote and signing up just to add another car or an option to your policy. Now, you simply fill out the electronic form with the additional information then you sign and send. Within minutes you get new policy documents with your new coverage. A few years back, an insurance agent was the only one to help you fill out a paper form that later was retyped into their system, filed, and stored. The process that takes now 2 or 3 minutes, back then it would have taken the agent anywhere from 20 to 30 minutes – not counting the time you spent on getting to the office, waiting, and going back home. Now, you simply take out your phone, go online and fill out what you need within minutes. 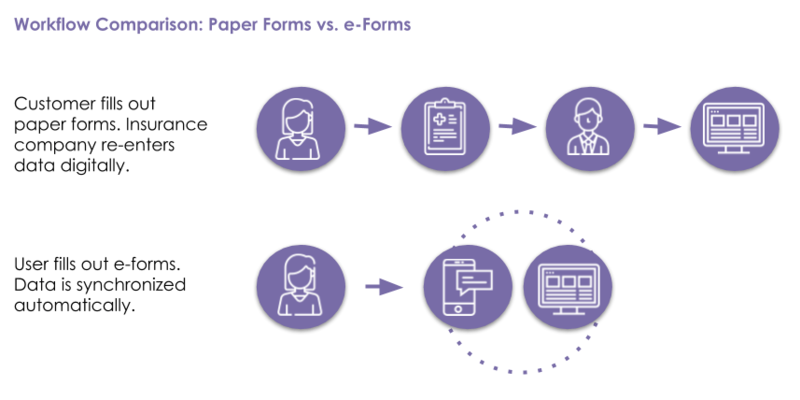 Electronic forms are the tool for process improvement where insurance companies benefit from higher efficiency, better time management, a higher level of organization, and increased customer satisfaction. If you need help or have any questions regarding the implementation of e-forms or e-signatures, don’t hesitate to contact us at Ecodocx. We are here to help! Cut costs associated with pre-printed paper forms which also includes printing, management, scanning, storage, and a waste of these forms. Eliminate compliance risk by removing outdated forms and standardizing forms that appear across the enterprise. Loss prevention of information due to misplaced documents. Maintain the continuity of customer information. Reduce errors in routing, completion, and delivery of forms. Automatic feed of customer data into dashboards and reports. Capture customer electronic signatures directly onto the forms. Ease of search, archiving, and retrieval of customer’s information.